This up-to-date handbook covers the main topics of preparation, characterization and properties of complex metal-based layer systems. The authors -- an outstanding group of researchers -- discuss advanced methods for structure, chemical and electronic state characterization with reference to the properties of thin functional layers, such as metallization and barrier layers for microelectronics, magnetoresistive layers for GMR and TMR, sensor and resistance layers. 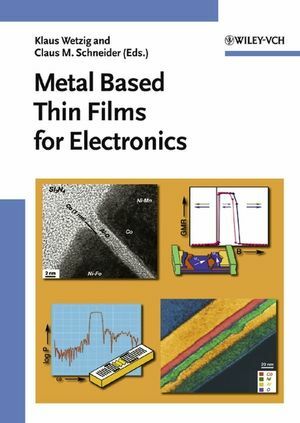 As such, the book addresses materials specialists in industry, especially in microelectronics, as well as scientists, and can also be recommended for advanced studies in materials science, analytics, surface and solid state science. Klaus Wetzig studied physics at the University of Technology in Dresden, receiving his licence in 1963, his doctorate in 1967 and his habilitation in 1973. In 1975 he moved to the Academy of Sciences, and since 1992 he is Full Professor of Materials Analysis at the University of Technology in Dresden and Director at the Leibniz Institute of Solid State and Materials Research Dresden. His research interests include materials analysis and microstructures, especially electron microscopy of functional materials, characterization of thin films for electronics, and nanostructural features in general. Claus Michael Schneider studied physics at the Institute of Technology Aachen receiving his diploma in 1985. He obtained his PhD in 1990 at the Free University of Berlin and his habilitation in 1996 at the Martin-Luther-University Halle. In 1998 he moved to the Leibniz Institute of Solid State and Materials Research Dresden, heading the department of thin film systems and nanostructures. In June 2003 he was appointed director at the Institut für Festk&ouml;rperforschung (IFF-IEE) of the Forschungszentrum J&uuml;lich. His research interests include solid state phys ics, thin film systems and surface magnetism as well as the physics of nanostructures. 1 Introduction (Klaus Wetzig and Claus M. Schneider). 2 Thin Film Systems: Basic Aspects. 2.1 Interconnects for Microelectronics (Ralph Spolenak and Ehrenfried Zschech). 2.1.3 Materials Science of Metallic Interconnects. 2.1.4 Function of Barrier and Nucleation Layers and Materials Selection. 2.2 Metallization Structures in Acoustoelectronics (Manfred Weihnacht). 2.2.2 Fundamentals of Surface Acoustic Waves. 2.3 Silicide Layers for Electronics (Joachim Schumann). 2.3.2 The Basic Chemical and Physical Properties. 2.3.4 Silicides with Metallic Conductivity. 2.3.6 Heterogeneously Disordered Silicide Films. 2.4 Complex Layered Systems for Magnetoelectronics (Claus M. Schneider). 2.4.4 Electric Transport in Layered Magnetic Systems. 2.4.5 Functional Thin Film Systems. 2.5 Multilayer and Single-Surface Reflectors for X-Ray Optics (Hermann Mai and Stefan Braun). 2.5.2 Refraction and Reflection at Single Boundaries. 2.5.3 BRAGG Reflection at 1D Lattice Systems. 3 Thin Film Preparation and Characterization Techniques. 3.1 Thin Film Preparation Methods (Christian Wenzel). 3.2 Electron Microscopy and Diffraction (Klaus Wetzig and Jürgen Thomas). 3.2.1 Transmission Electron Microscopy (TEM) - Imaging. 3.2.2 TEM - Selected Area Electron Diffraction. 3.3 X-Ray Scattering Techniques (Michael Hecker). 3.3.3 Soft X-Rays and Magnetic Scattering. 3.4 Spectroscopic Techniques (Klaus Wetzig). 3.4.2 Element Depth Profile Analysis. 3.5 Stress Measurement Techniques (Winfried Brückner). 4 Challenges for Thin Film Systems Characterization and Optimization. 4.1 Electromigration in Metallization Layers (Ralph Spolenak, et al.). 4.1.2 Methods for Quantitative Damage Analysis. 4.2 Barrier and Nucleation Layers for Interconnects (Ehrenfried Zschech). 4.2.2 PVD Barrier Layers for Copper Interconnects. 4.2.3 Barrier/Seed Microstructure and Step Coverage. 4.2.4 New Barrier/Seed Concepts using CVD and ALD. 4.2.5 Atomic Layer Deposition (ALD). 4.3 Acoustomigration in Surface Acoustic Waves Structures (Siegfried Menzel and Klaus Wetzig). 4.3.3 Metallization Concepts for Power SAW Structures. 4.4 Thermal Stability of Magnetoresistive Layer Stacks (Claus M. Schneider and Jürgen Thomas). 4.4.1 Metallic Multilayers as GMR Model Systems. 4.5 Functional Magnetic Layers for Sensors and MRAMs (Hartmut Vinzelberg and Dieter Elefant). 4.5.1 Magnetic Multilayers: Layer Thickness Dependence of the GMR Parameters. 4.6 Multilayers for X-Ray Optical Purposes (Hermann Mai and Stefan Braun). 4.6.1 Multilayers as Reflectors for X-Rays. 4.6.2 Real Structure of nm-Multilayers. 4.6.4 Multilayers with Uniform and Graded Period Thickness. 4.7 Functional Electric Layers (Joachim Schumann and Jürgen Thomas). 5.1 Devices Related Aspects for Si Based Electronics (Ehrenfried Zschech). 5.1.1 Interconnect Technology and Materials Trends for Memory and Logic Products. 5.1.2 Copper Inlaid Process: Process Integration and Materials Related Topics. 5.1.3 Wiring Hierarchy for Copper/Low-K on-Chip Interconnects. 5.1.4 New Global Interconnect Concepts. 5.2 SAW High Frequency Filters, Resonators and Delay Lines (Manfred Weihnacht). 5.2.4 Filters with Spread Spectrum. 5.3 Sensor Devices (Christoph Treutler). 5.3.2 Requirements for Thin Films to be Used as Transducers. 5.3.3 Thin Film Strain Gauges for Pressure Sensors and Force Meters. 5.3.4 Thin Film Thermometer in a Micromachined Air-Mass Flow Meter for Automotive Application. 5.3.5 Magnetic Thin Films for Measuring Position, Angle, Rotational Speed and Torque. 5.4 X-Ray Optical Systems (Hermann Mai and Stefan Braun). 5.4.1 Basic Properties of the Combination of X-Ray Optical Elements. 5.4.4 Extreme Ultraviolet Lithography (EUVL). 5.4.5 X-Ray Reflectometry and Diffractometry. 5.5 Thermoelectric Sensors and Transducers (Joachim Schumann). 5.5.2 Thermoelectric Energy Conversion - Some Basic Considerations. 6 Outlook (Klaus Wetzig and Claus M. Schneider).